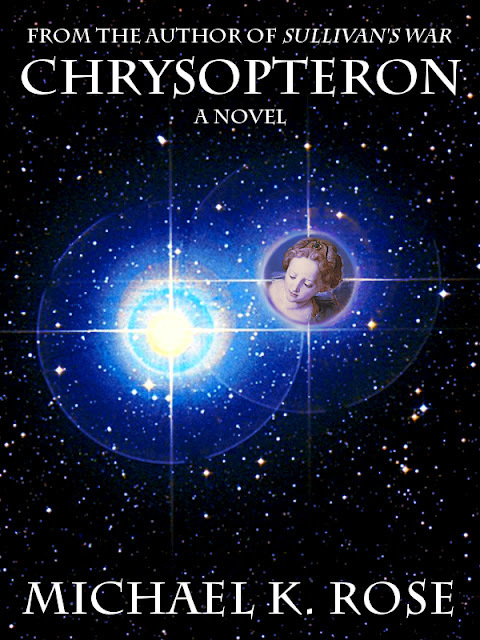 On the 21st of December, I release my new novel Chrysopteron. Captain John Hayden, haunted by memories of war and still grieving the death of his wife, is about to embark on the most important mission of his career: to discover the fate of the Chrysopteron, one of five generation ships which left the Earth centuries earlier. The descendants of the Chrysopteron’s original crew had successfully colonized their planet, but less than a hundred years later, all contact was lost. Hayden knows that a mysterious new religion which was formed onboard the ship may have played a role in determining the fate of the colonists, but there is no way to know what he and his crew will find when they finally arrive. Two main elements make up the cover. The first is an image of the optical double star Alpha Capricorni. An optical double is a pair of stars that appear to be close together from our perspective but are, in fact, quite distant from one another. The second image is a detail from a fresco in the Palazzo Vecchio in Florence painted by Bronzino, one of my favorite Mannerist painters. The image of the woman represents the Greek goddess Iris. The name of the book (and the ship) refers to her as well: Chrysopteron is one of Iris's epithets and means "golden winged." Like Hermes, Iris is a messenger and a link between humanity and the gods. She is also a goddess of the sea and sky and the rainbow was one of her main symbols. All this is very important to the story in Chrysopteron, but I can't reveal too much without giving away key plot points. Watch this blog for the release announcement on the 21st. I do hope you decided to check it out. Beautiful, Michael! Absolutely love what has become of this. And I prefer this new image from the Vecchio painting. I also like all the meaning behind the imagery. Crazy about that kind of stuff. Well done, sir! You had me at "religion aboard a spaceship." Now I'm intensely curious as to what that could be. Looking forward to reading it.